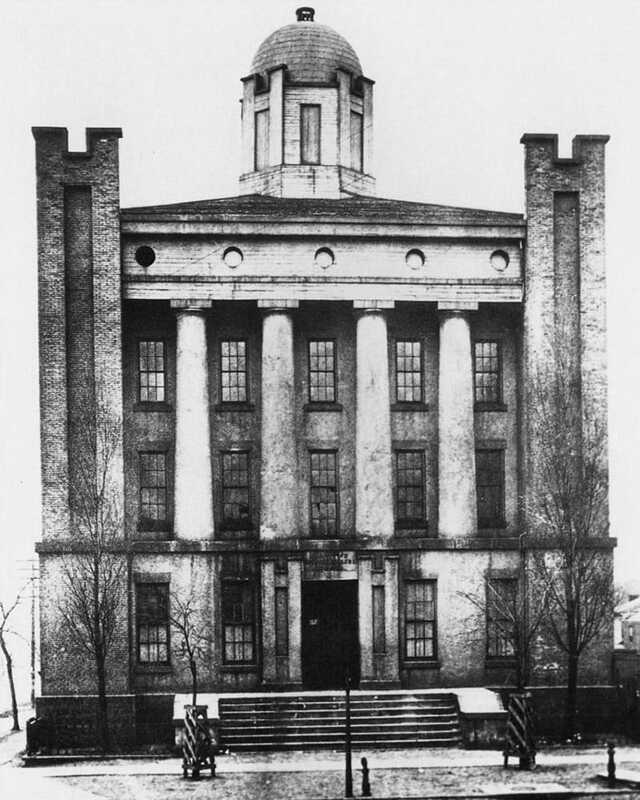 The story of University Hospitals began 150 years ago, on May 14, 1866. From its humble beginnings as a single hospital in a two-story wooden house in Cleveland, University Hospitals has grown into a multihospital health system that includes a thriving academic medical center, 18 hospitals, 40 health centers and dozens of medical practices – all working together to serve 1 million people throughout Northeast Ohio. 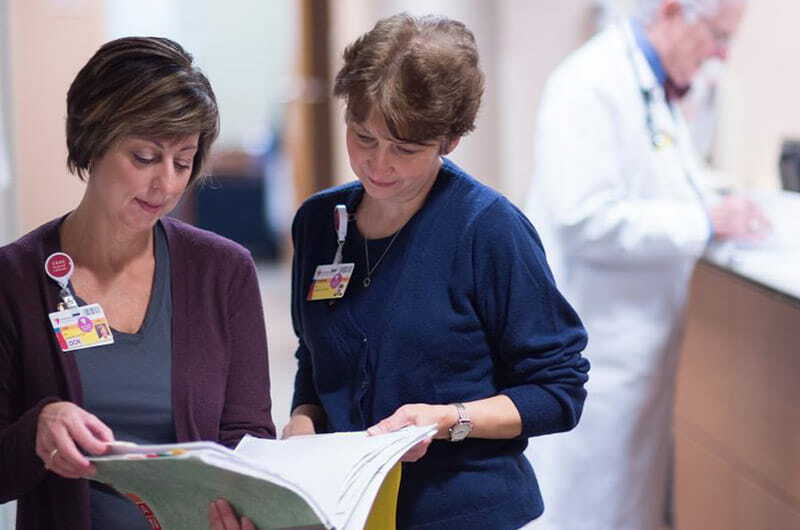 As University Hospitals took shape over the years, it distinguished itself within the Northeast Ohio community and across the country. Our national reputation for providing high-quality care, our direct involvement in pioneering medical advancements and clinical discoveries, and a continued commitment to training the next generation of health care providers demonstrate that from the beginning, we were living the UH mission: To Heal. To Teach. To Discover. Our history is richly woven into the growth of this community, and having the support and trust of the people we serve has enabled us to flourish through the decades and become a respected community leader. UH is prepared for the future of medicine, inspired by our rich history and dedicated to our mission. We look forward to continuing to serve Northeast Ohio with purpose, passion and promise for decades to come. 1866: The first meeting of civic leaders and parishioners of Cleveland’s Old Stone Church to establish a hospital took place on May 14, 1866. 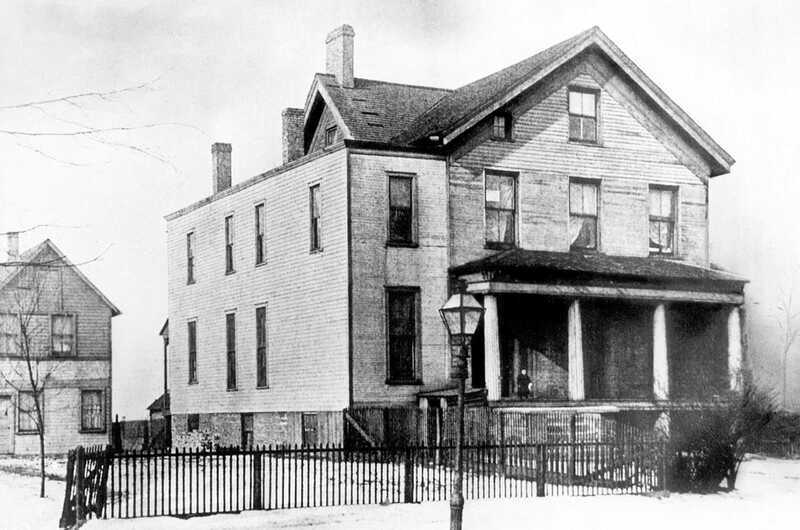 1868: Wilson Street Hospital opened in a small house on Cleveland’s lakefront to provide Cleveland city residents access to medical care. 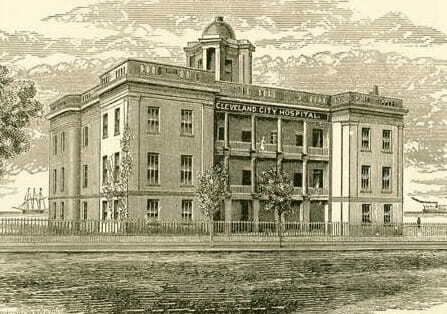 1875: Wilson Street Hospital moved to the federal government’s Marine Hospital building, leasing it for $1 a year for 20 years, and adopted the name Cleveland City Hospital in 1876. 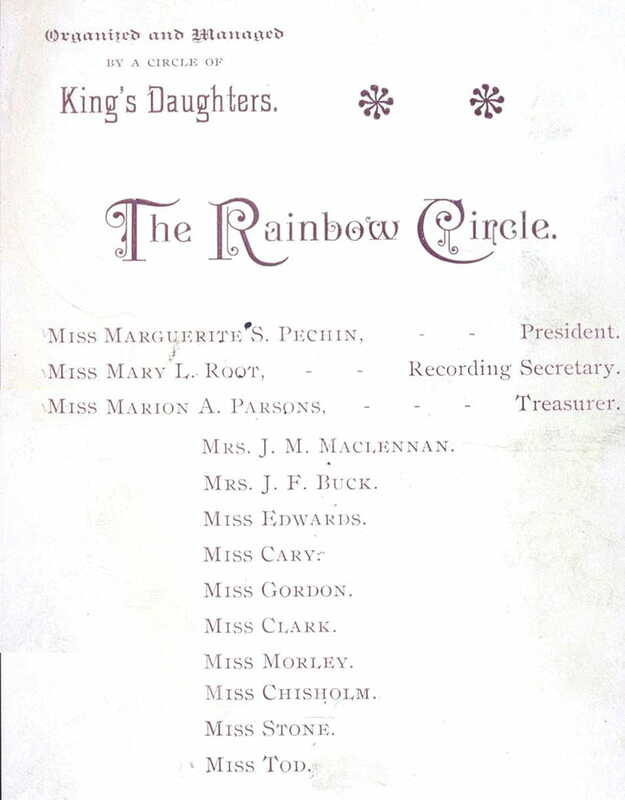 1887: Nine teenage girls from prominent Cleveland families formed the Rainbow Circle of King’s Daughters, a group devoted to helping the city’s sick and poor children. 1888: Cleveland City Hospital formally changed its name to Lakeside Hospital. 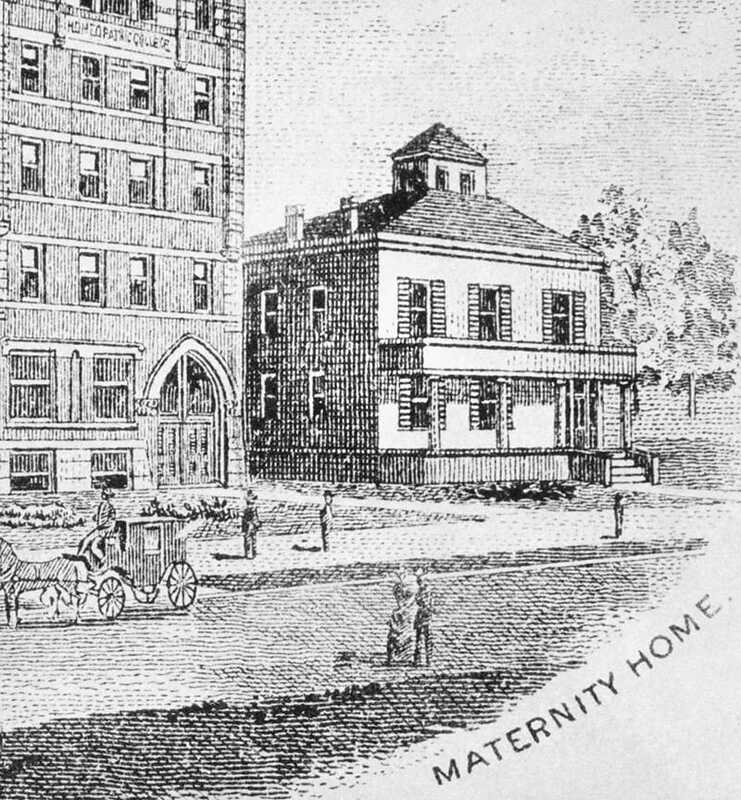 1891: Maternity Home of Cleveland, renamed Maternity Hospital in 1892, was established to provide obstetrical services and care for women throughout Cleveland. 1891: Rainbow Cottage opened, caring for 32 patients its first summer. 1894: The White Hospital (today UH Portage Medical Center) opened in Ravenna. 1895: Lakeside Hospital affiliated with the Medical Department of Western Reserve University (today Case Western Reserve University School of Medicine). 1898: The new Lakeside Hospital opened next to the old Marine Hospital on Lake Street (today Lakeside Avenue). 1898: Lakeside Training School for Nurses opened. 1899: UH administrator James Knowles established the forerunner of the American Hospital Association. 1902: John James R. Macleod, MD, conducted research that led to the discovery of insulin. 1905: Rainbow Cottage relocated to Green Road in South Euclid. 1906: Memorial Hospital (today UH Geneva Medical Center) opened. 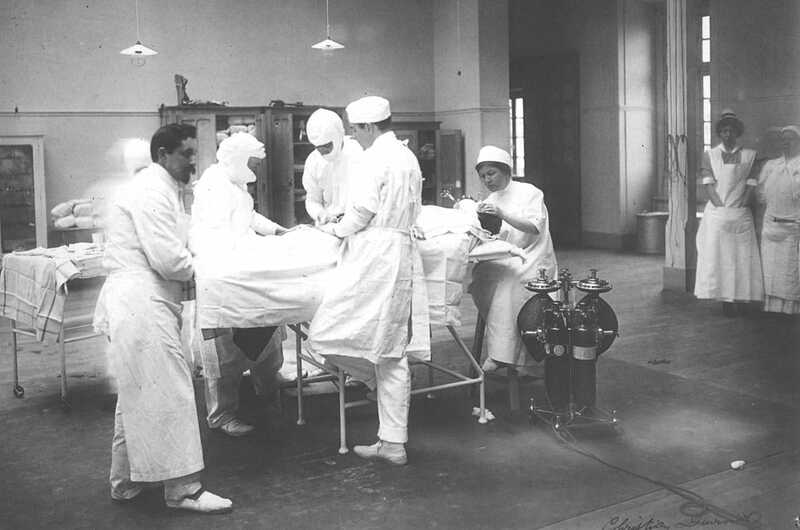 1906: George Crile, MD, performed the first radical neck dissection for laryngeal and other cancers of the neck. 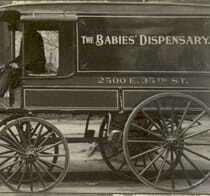 1906: Babies’ Dispensary and Hospital opened. It was among the first facilities in the country devoted to the care of children and the training of physicians in this discipline. 1907: Charles Franklin Hoover, MD, is the first to describe two physical signs that help physicians diagnose certain conditions. Both named “Hoover’s sign,” one is used in neurology for detecting weakness in the legs and the second in pulmonology for detecting lung disease. 1908: Elyria Memorial Hospital (today UH Elyria Medical Center) opened. 1908: The Community Hospital of Bedford (today UH Bedford Medical Center) opened. 1910: Lakeside Hospital was the world’s first hospital to perfect the manufacture of nitrous oxide gas. 1912: Samaritan Hospital (today UH Samaritan Medical Center) opened in Ashland. 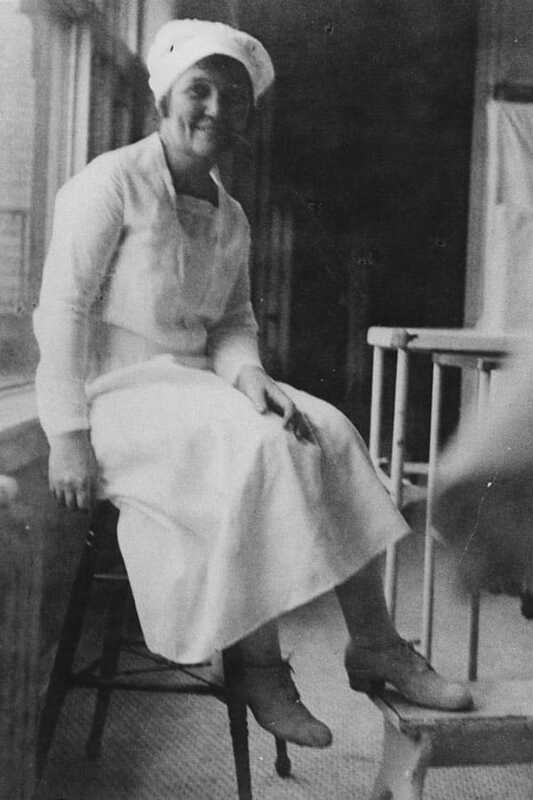 1912: The nation's first school of nurse anesthesia, under the direction of Agatha Hodgins, RN, was established at Lakeside Hospital. 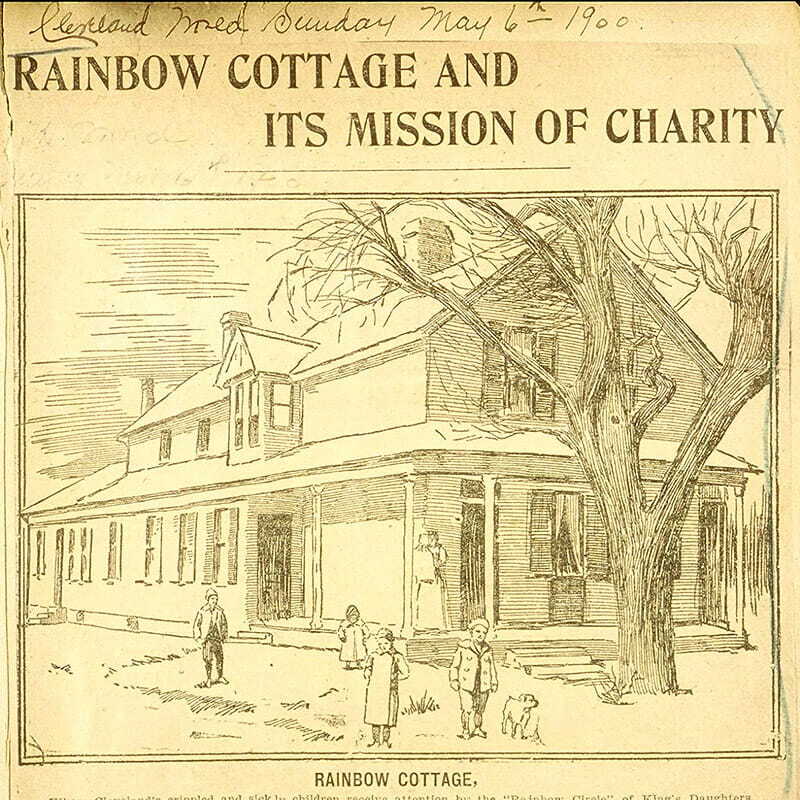 1914: After several moves, Rainbow Cottage changed its name to Rainbow Hospital for Crippled and Convalescent Children. This same year a brand new facility was built for the hospital. 1917: The Lakeside Unit was deployed as the first American military unit on European soil during World War I. 1917: David Marine, MD, discovered that goiter can be prevented and cured by iodine supplementation, leading to the availability of iodized salt around the country and the world. 1917: The American Dietetic Association was founded in Cleveland at Lakeside Hospital. 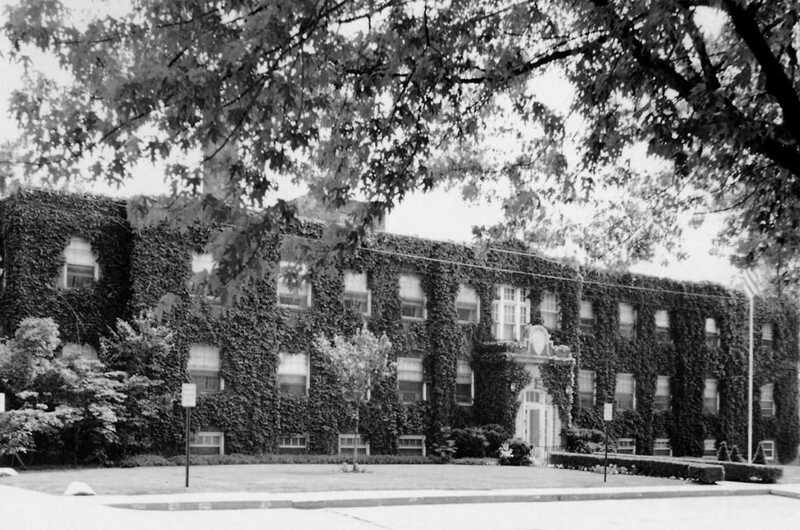 1919: Brown Memorial Hospital (today UH Conneaut Medical Center) opened. 1920: Frederick Mautz, MD, designed an artificial pulmonary ventilation machine. 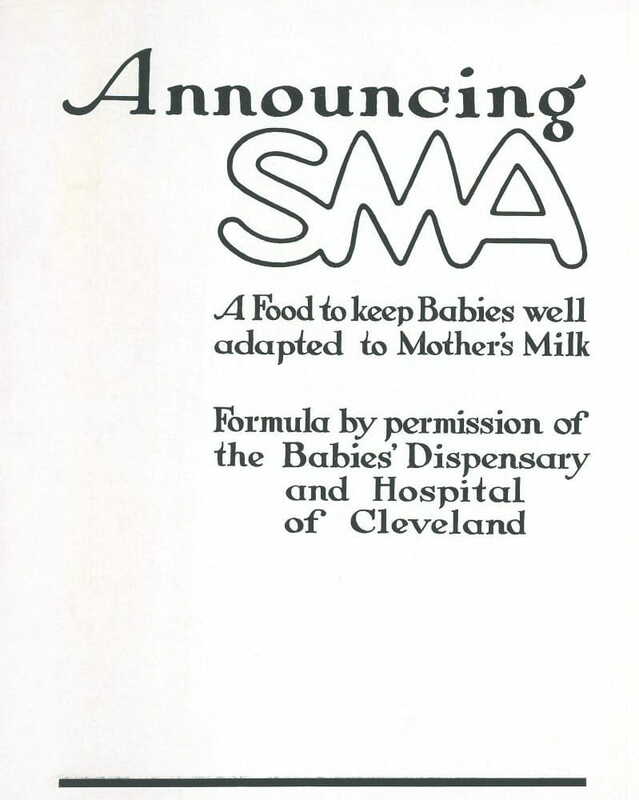 1923: Henry Gerstenberger, MD, received a patent for infant formula known as SMA (Synthetic Milk Adapted), developed at Babies Dispensary and Children’s Hospital in collaboration with Harold Ruh, MD, and biochemist William Frohring. 1923: A seven-day capital campaign raised $2.75 million, surpassing its original goal of $2.5 million, to raise funds to build new facilities in University Circle for Babies and Children’s and Maternity hospitals. 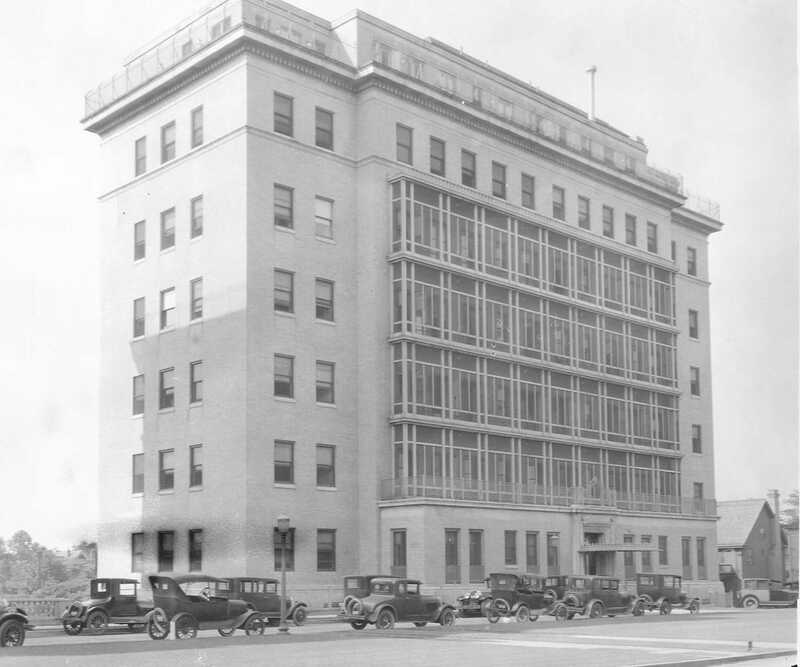 1924: Babies’ Dispensary and Hospital moved to University Circle and was renamed Babies and Children’s Hospital. Maternity Hospital also moved to the medical center campus the same year. 1924: Lakeside Nurses Training School merged into Western Reserve University’s new school of nursing, which later became the Frances Payne Bolton School of Nursing. 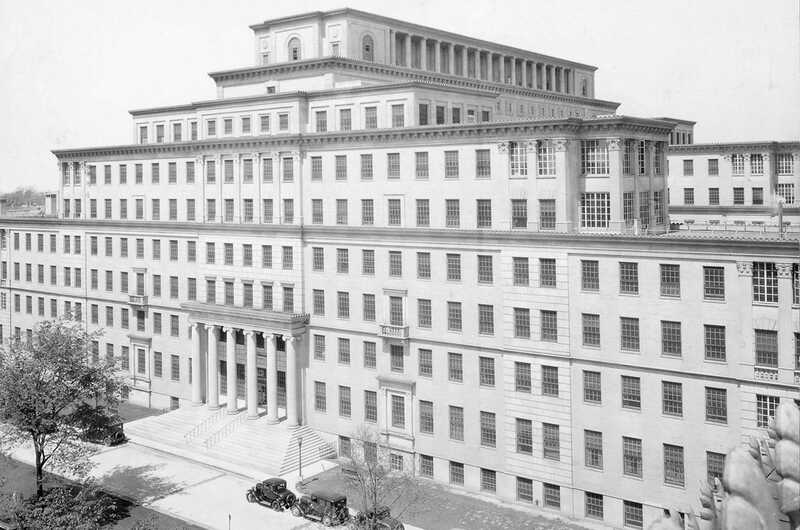 1925: UH became the first multihospital system in northeast Ohio, comprising Lakeside Hospital, Babies and Children’s Hospital and Maternity Hospital. 1927: Rainbow Hospital joined University Hospitals but remained in South Euclid. 1927: A five-day fundraising campaign raised more than $8 million for a new Lakeside Hospital to be built on the University Circle campus, and a new Rainbow Hospital in South Euclid. 1929: Harry Coulby designated in his will that the bulk of his $3.2 million estate be left to The Cleveland Foundation, with half the money designated for the benefit of Lakeside Hospital. 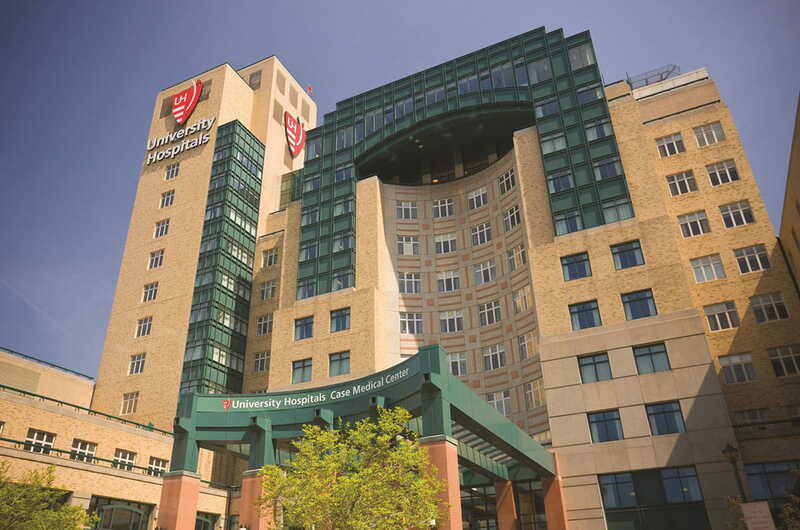 The endowment continues to support University Hospitals today. 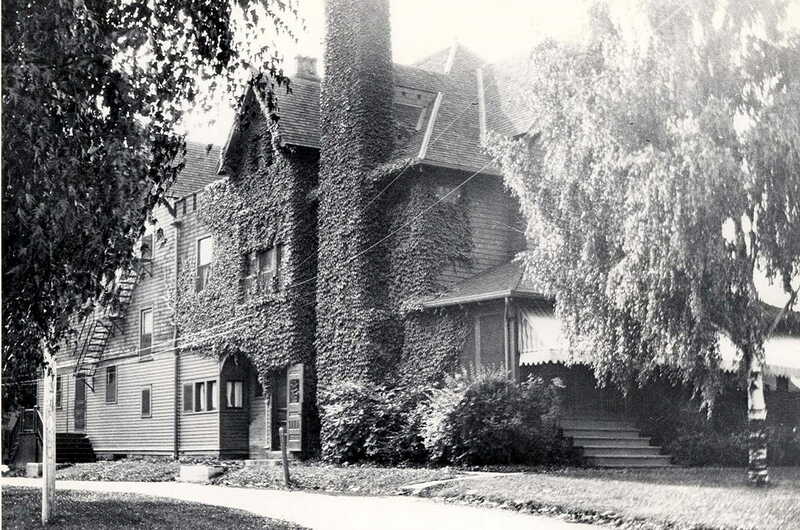 1931:The new Lakeside Hospital and adjoining Leonard C. Hanna House opened on the University Circle campus. 1933: Claude Beck, MD, performed the first successful removal of a heart tumor. 1933: The Great Depression forced the two-year closure of Maternity Hospital and Babies and Children's Hospital, causing their operations to move into Lakeside Hospital until they reopened in 1935. 1934: Harry Goldblatt, MD, described the role of the kidneys in hypertension (high blood pressure), laying the foundation for the discovery of renin and eventually the development of enzyme-inhibitor medications to treat chronic hypertension. 1935: Claude Beck, MD, performed the first operation for coronary artery disease. 1939: Charles I. Thomas, MD, performed the first corneal transplant in Northeast Ohio, paving the way to restored vision for millions of people. In 1958, he established the Cleveland Eye Bank (now Eversight Ohio). 1941: The Lakeside Unit was reactivated and deployed to the South Pacific to staff the first American military hospital in World War II. 1944: Walter Heymann, MD, began research on kidney disease in children. 1946: Louis Pillemer, PhD, developed preparations of tetanus antigen, leading to the first successful triple vaccine (DPT) targeting diphtheria, pertussis (whooping cough) and tetanus, which virtually eliminated these once-fatal diseases in the U.S.
1947: Claude Beck, MD, performed the first successful defibrillation of a human heart. 1947: Hymer Friedell, MD, initiated research that became the essential source of information on the long-term effects of radiation on humans. 1950: William Holden, MD, performed the first successful femoro-popliteal bypass (from the thigh to the lower leg), using a section of the patient’s own vein. 1951: James Reagan, MD, pioneered cytopathology for cancer detection and introduced diagnostic terminology for Pap smear results reporting, including dysplasia, carcinoma in situ and squamous carcinoma. 1952: Claude Beck, MD, helped develop cardiopulmonary resuscitation techniques and played an instrumental role in promoting their use. 1952: Use of chloramphenicol in blood disease was developed by Austin Weisberger, MD. 1953: Frank Nulsen, MD, pioneered pressure-regulated one-way valves for the treatment of hydrocephalus (water on the brain). He, along with Charles Herndon, MD, and Lester Persky, MD, also established one of the first hydrocephalus and myelodysplasia clinics for children in the country. 1953: Liver scan by radioisotopes was introduced by Hymer Friedell, MD, and Abbas Rejali, MD. 1953: Oscar Ratnoff, MD, an international expert on blood coagulation, discovered the Hageman Blood Factor. This work led to the 1975 discovery of the Fitzgerald Factor (Factor XI). 1954: Louis Pillemer, PhD, in collaboration with Irwin Lepow, PhD, and Enrique Ecker, PhD, discovered an alternative pathway for the immune response that does not involve antibodies. Drs. Ecker and Lepow also defined components of the classical pathway of complement activation, a system of proteins in the blood that is activated to initiate the immune response. 1955: Alan Moritz, MD, known as the Father of Forensic Pathology, worked to establish forensic pathology as a medical subspecialty and influenced the development of a professional U.S. medical examiner system, displacing lay coroners in that position. 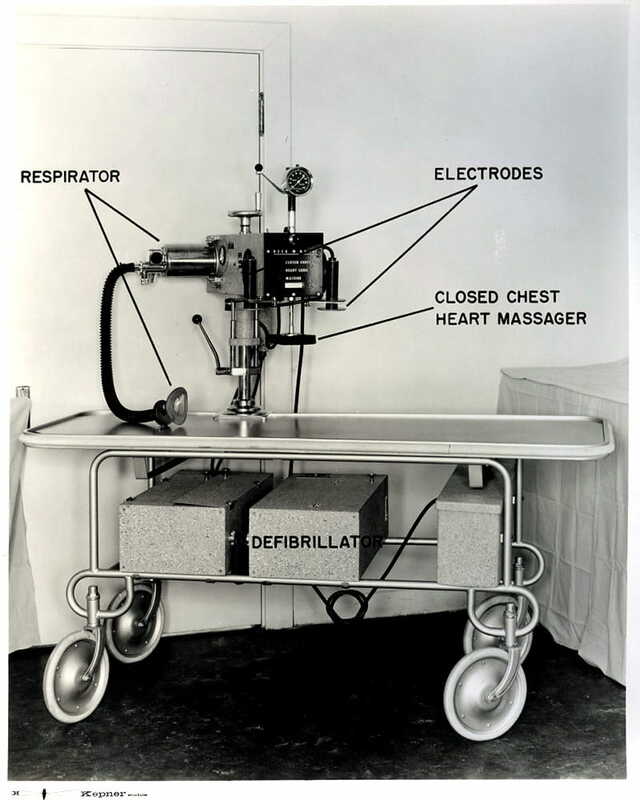 1955: Claude Beck, MD, and Walter Pritchard, MD, performed the first successful reversal of a fatal heart attack outside of an operating room, with open heart massage. 1956: The Howard M. Hanna Pavilion opened on the University Circle campus for the care of psychiatric patients. It was one of the first psychiatric hospitals in the country located on the main campus of an academic medical center, and the first psychiatric hospital to open in Cleveland. The pavilion was made possible through a 1946 philanthropic gift made by the coworkers and family of longtime UH trustee Howard M. Hanna, Jr.
1957: Robert Izant, MD, performed the first successful surgery on infants to connect the stomach and intestinal tract. 1957: Leroy Matthews, MD, developed the first comprehensive treatment program for cystic fibrosis in the nation, and along with Carl Doershuk, MD, demonstrated dramatic improvements in survival seven years later for patients treated with this therapeutic regimen. 1958: Benjamin Spock, MD, launched his groundbreaking child-rearing study that explored breast-feeding, weaning, toilet training and separation anxiety while an associate physician in the Department of Psychiatry. 1959: The Leonard C. Hanna Jr. Fund donated $10 million to University Hospitals, at the time the largest gift in the hospital’s history. A portion of the gift was used for construction projects and the remainder went into an endowment fund that continues to support UH today. 1959: Geauga Community Hospital (today UH Geauga Medical Center) opened. 1961: Richmond Heights General Hospital (today UH Richmond Medical Center) opened. 1961: Parma Community General Hospital (today UH Parma Medical Center) opened. 1961: Albert Potts, MD, PhD, receives the Association of Research in Vision and Ophthalmology Friedenwald Award for his studies of alcohol toxicity on the optic nerve, which helped advance the understanding of how the optic nerve works. 1962: Joseph T. Wearn Laboratory for Medical Research opened on the University Circle campus. 1962: Joseph M. Foley, MD, coined the term “asterixis,” a kind of tremor that occurs in patients with encephalopathy. He was also the first to describe “benign fasciculations,” muscle twitching that commonly occurs in some people that is not associated with any muscle disease. 1965: Kenneth Ryan, MD, was the first in the world to describe how human ovaries produce estrogen from two types of specialized ovarian cells, laying the foundation for advances in female health. 1966: Edward Purnell, MD, pioneered the use of B scan ultrasonography to study the eye and orbit and diagnose eye and orbital diseases. In 1972 he developed the first hand-held ultrasound device for the eye. 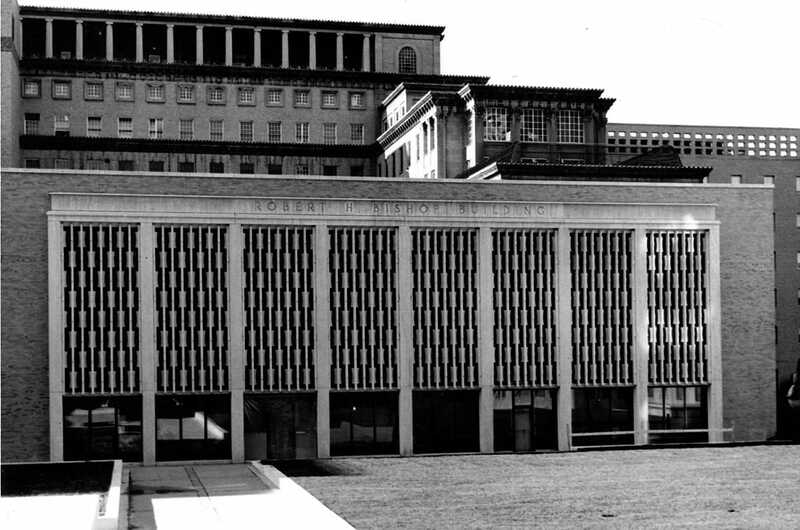 1967: The Robert H. Bishop Building on the University Circle campus opened. 1968: S.S.C. Yen, MD, developed the first radioimmunoassay techniques for the measurement of three important pregnancy hormones, enhancing the evaluation of maternal and infant health in pregnancy. 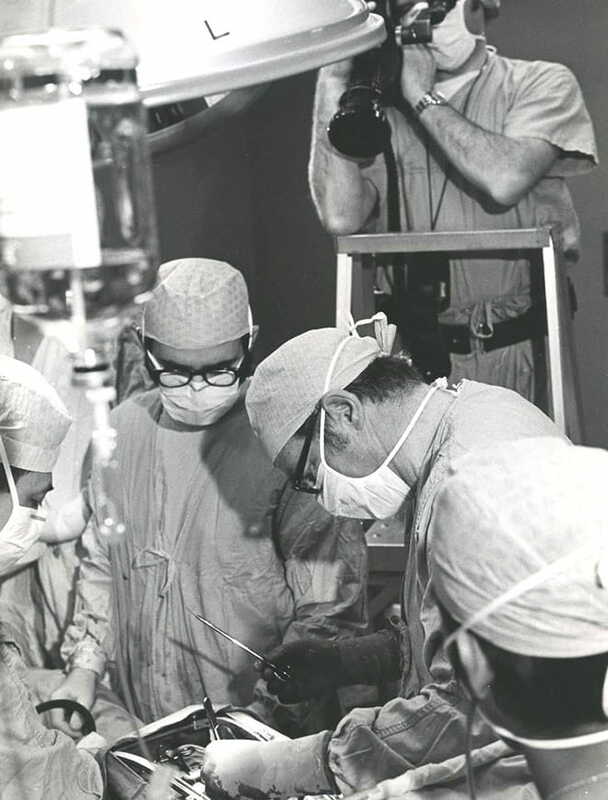 1969: Jay Ankeney, MD, performed the first successful off-pump open-heart procedure, which later became the basis for minimally invasive heart surgery. 1969: Research by Olaf Pearson, MD, developed the role of prolactin in breast cancer and pituitary glands. 1969: The role of cholesterol in blood vessel disease was developed by William Insull, MD. 1970: Walter Maloney, MD, developed the Maloney esophageal dilator, a surgical tool for enlarging the esophageal opening, still the most widely used surgical instrument of its kind. 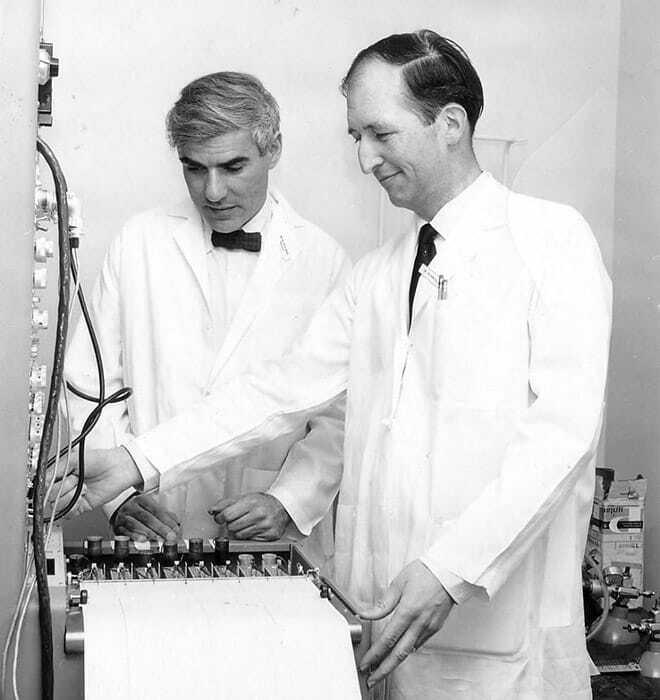 1970: Measurement of lung function using isotopes and computer drawings developed by Scott Inkley, MD, and James MacIntyre, MD. 1971: Rainbow Hospital moved to University Circle, and the facility in South Euclid was later redeveloped into the UH Suburban Health Center. 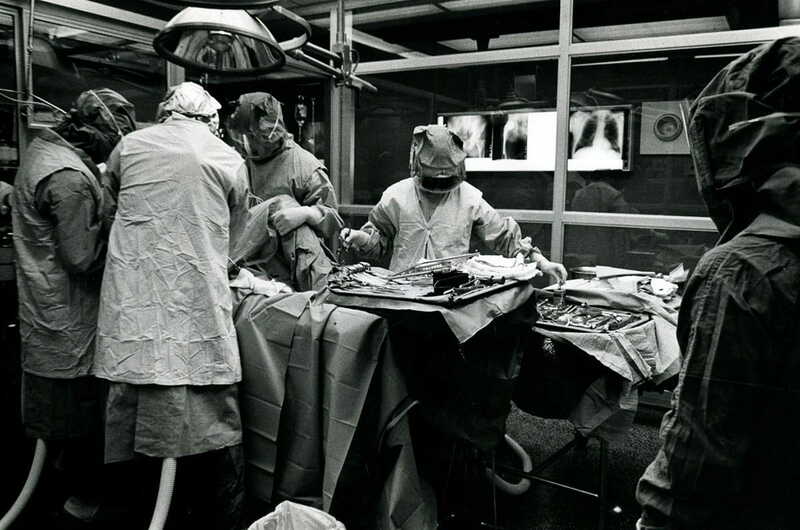 1971: Charles Herndon, MD, was one of first surgeons in the U.S. to perform a hip replacement, conducting the procedure in a specially constructed operating room he designed to reduce infection in joint replacement surgery. 1971: A “Glass House” was developed to reduce infection in total hip replacement surgery. 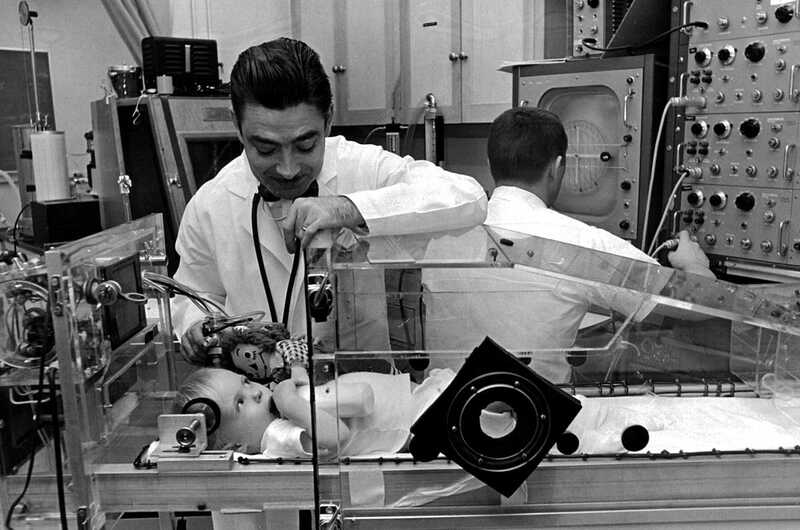 1971: Angel Frame invented by UH employee Angel Martinez for care of newborns. 1972: Robert Stern, MD, developed the heparin lock, eliminating the need for continuous hookup to an intravenous line for children needing frequent IV administration of antibiotics, which eventually led to home IV therapy. 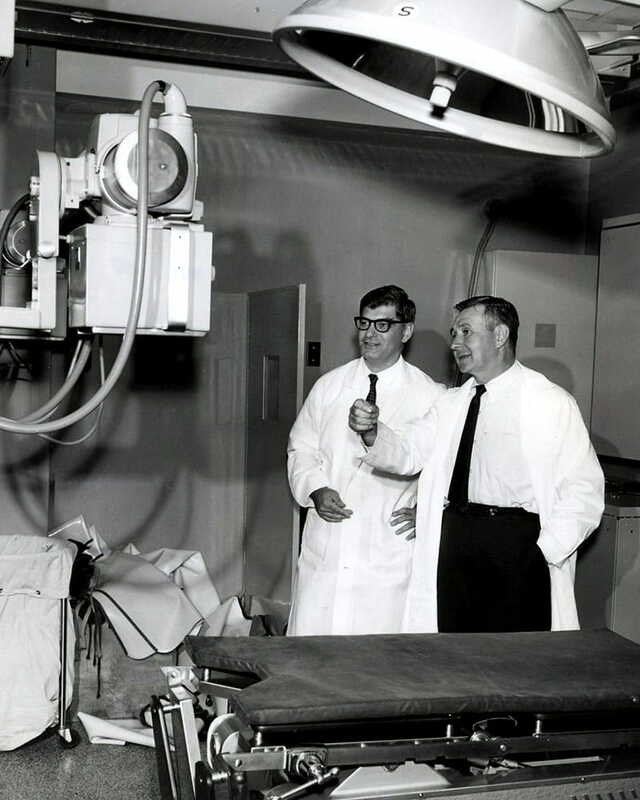 1972: Clyde Nash, MD, Richard Brown, PhD, and Albert Burstein, PhD, developed intraoperative spinal cord monitoring, dramatically improving the safety of complex spinal surgery. 1972: John Kennell, MD, and Marshall Klaus, MD, demonstrated the importance of maternal-infant bonding, leading to revolutionary changes in the care of mothers and newborn infants in hospitals throughout the western world. 1972: A bypass heart surgery method using blood vessel grafts without stopping the heart was perfected by Jay Ankeney, MD. 1973: John Kattwinkel, MD, Avroy Fanaroff, MD, and Marshall Klaus, MD, with David Fleming from Biomedical Engineering, developed silicone nasal prongs for the application of continuous positive airway pressure in treating respiratory distress in pre-term and near-term neonates. 1974: Total jaw replacement procedure perfected by Clifford Kiehn, MD. 1974: Rainbow Hospital merged with Babies and Children’s Hospital to become Rainbow Babies & Children’s Hospital. 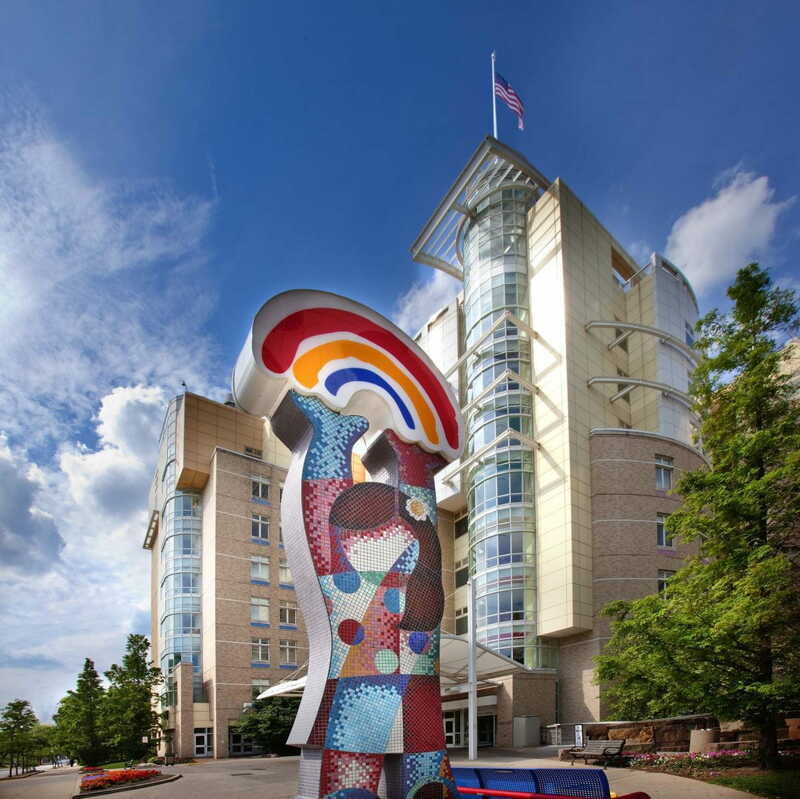 Nationally ranked University Hospitals Rainbow Babies & Children’s Hospital’s main entrance is made more welcoming through the colorful statue, “Where Dreams Come True,” designed by Hector Vega and generously donated by Iris and the late Mort November in celebration of the life of Debra Ann November. 1976: Beno Michel, MD, discovered a method for preserving skin tissue for use in laboratory immune system testing. 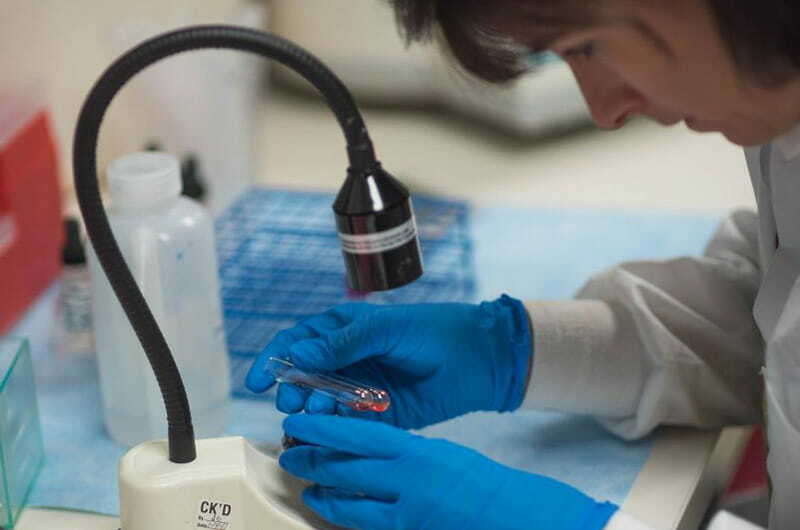 Michel’s Transport Solution remains the gold standard for safely storing tissue samples during transport. 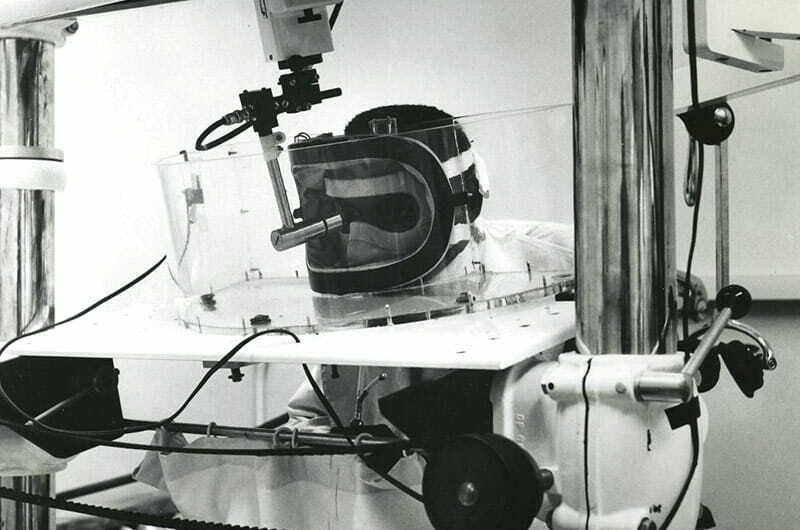 1976: John R. Haaga, MD, pioneered the use of computed tomography (CT) to guide biopsies, nerve blocks, abscess drainage and cancer treatment, significantly reducing the need for patients to have open surgery. 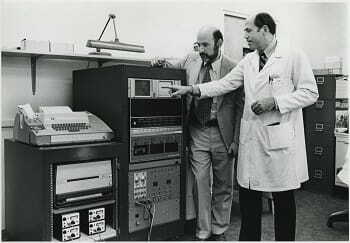 1978: Research technique to record accurate cardiac output was developed by Herman K. Hellerstein, MD, Anthony Bacevice, MD, and Peter Katona, MD. 1978: Ohio’s first bone marrow bank was established by Roger Herzig, MD. 1978: The George M. Humphrey Building with a new emergency room opened on the University Circle campus. 1979: Jeffrey Ponsky, MD, and Michael Gauderer, MD, performed the first percutaneous endoscopic gastrostomy on infants, safely inserting a feeding tube in a minimally invasive manner in a baby’s stomach. 1980: Irwin Merkatz, MD, conducted the first clinical trials of ritodrine, the first Food and Drug Administration-approved drug to inhibit pre-term labor, at UH MacDonald Women’s Hospital. 1980: The world’s first known survivor of ricin poisoning was treated by Leigh Thompson, MD. 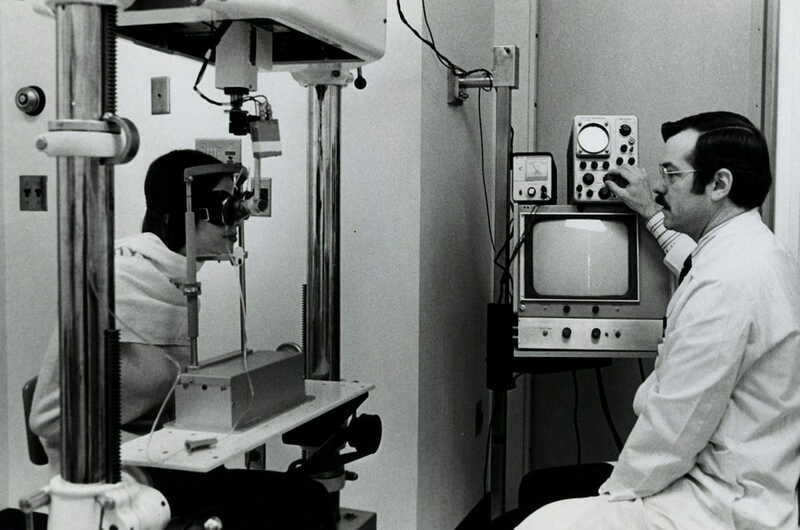 1980: Robert B. Daroff, MD, established the Daroff-Dell'Osso Ocular Motility Laboratory at the Louis Stokes Cleveland VA Medical Center, one of the premier Neuro-Ophthalmology research laboratories in the world. 1980: Martin Resnick, MD, pioneered the use of transrectal ultrasound guided prostate imaging and biopsy, which became the standard of care to diagnose prostate cancer. 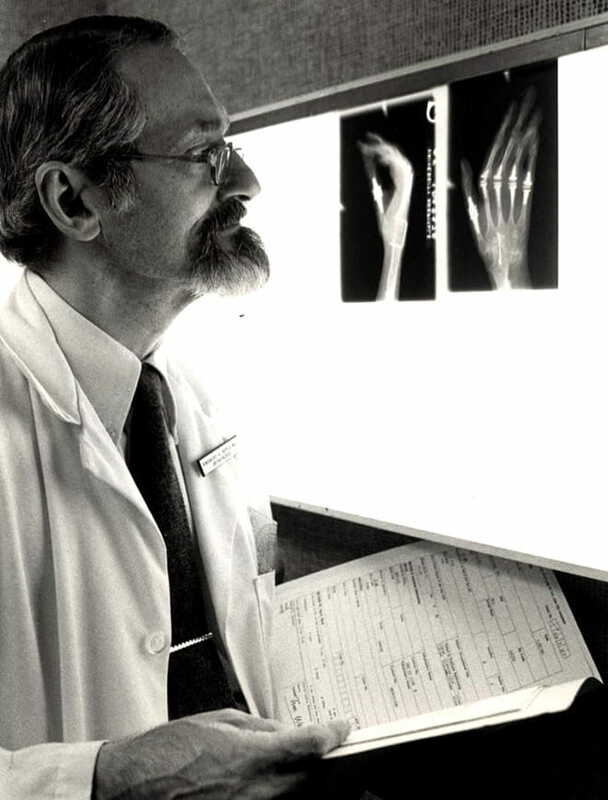 1980: Kingsbury Heiple, MD, pioneered the improvements of artificial finger joints. 1981: Nikon Cheung, MD, and other researchers at Rainbow Babies and Children’s Hospital, pioneered work treating neuroblastoma patients with antibodies, significantly advancing the field of targeted cancer immune-therapy. 1981: The cancer program at UH was renamed the R. Livingston Ireland Cancer Center, in recognition of the longtime UH trustee who was instrumental in securing $14 million from the state of Ohio. 1981: The first pediatric bone marrow transplant in Ohio was performed by Peter Coccia, MD. 1981: Pioneering embolization to cure high blood pressure was performed by Joseph Puma, MD, Ralph Alfidi, MD, and Ian Dresner, MD. 1981: St. John and West Shore Hospital (today UH St. John Medical Center) opened in Westlake. Originally co-owned by St. John Hospital and the West Shore Osteopathic Hospital, the hospital was operated by the Sisters of Charity of St. Augustine. 1982: Randall Marcus, MD, developed revolutionary improvements in the design of an interlocking nail system to repair fractures, particularly of the long bones, which improves the healing rate and reduces the risk of infection. 1982: First hospital in U.S. to house superconducting whole-body Nuclear Magnetic Resonance (NMR) Scanner for diagnostic imaging without x-ray radiation. 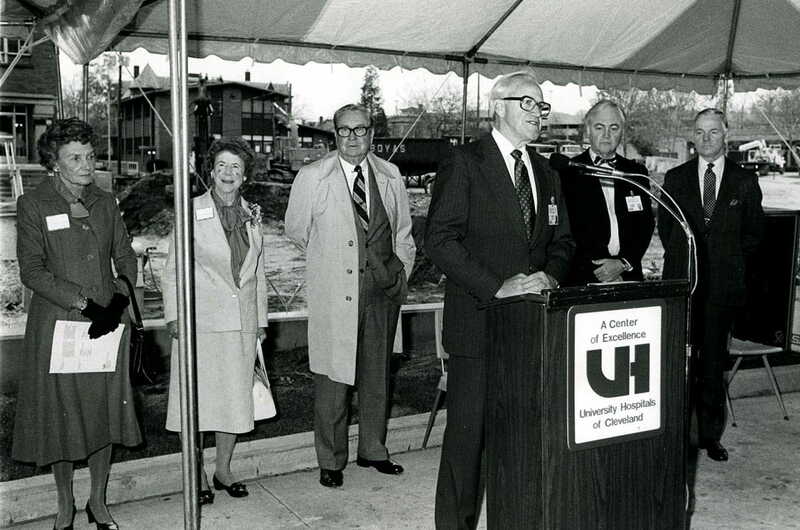 1984: University Hospitals Health Center opened on the University Circle campus; it was renamed Harry J. Bolwell Health Center in 1986 after the hospital's board chairman. 1984: University Hospitals was named one of 41 original Magnet Hospitals by the American Academy of Nursing Task Force on Nursing. 1986: Arthur Zinn, MD, Douglas Kerr, MD, Charles Hoppel, MD, published the first description and detailed characterization of a defect (in the enzyme fumarase) in the famous pathway required for energy metabolism, the Krebs cycle. 1987: Jerrold Ellner, MD, and Frederick Robbins, MD, established a memorandum of understanding with Makerere University in Uganda, linking Cleveland and Kampala AIDS research and care efforts. This linkage helped drive Uganda’s leadership response to the emerging AIDS epidemic in Africa. 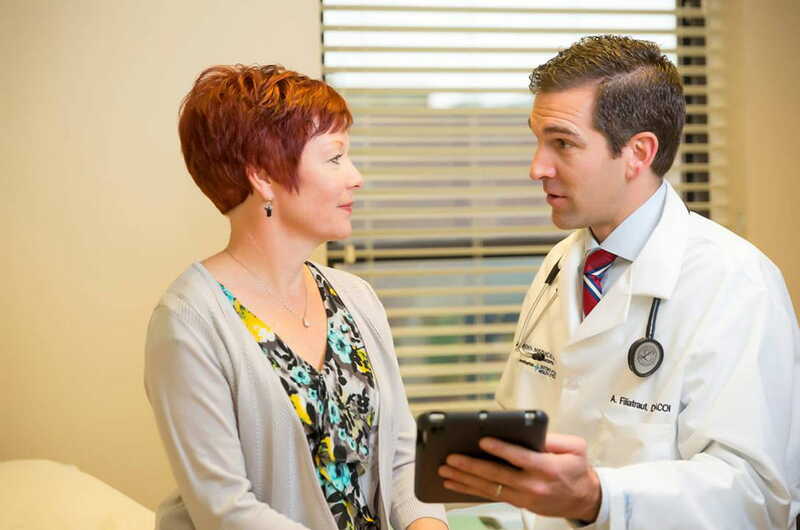 1987: Ireland Cancer Center, in collaboration with Case Western Reserve University School of Medicine, MetroHealth Medical Center and the Veterans Affairs hospital, became the only NCI-designated Comprehensive Clinical Cancer Center in the area. 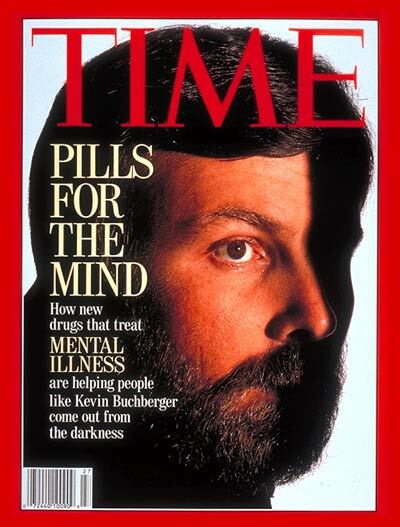 1988: Herbert Meltzer, MD, conducted the first human trials of clozapine and established it as an effective medication for treatment-resistant schizophrenic patients. Clozapine remains the most effective antipsychotic agent available today. 1988: The University Hospitals Health System formed. 1989: Joseph Calabrese, MD, in collaboration with researchers at Case Western Reserve University, launched groundbreaking studies that show the effectiveness of anticonvulsants and atypical antipsychotics in treating bipolar disorder. 1989: Anthony Maniglia, MD, Chair, and Laura Cozzi, MD, established a technique for safe outpatient tonsillectomy and adenoidectomy, using bismuth to control bleeding. 1989: Olof Pearson, MD, and Charles Hubay, MD, pioneered the use of the drug tamoxifen for breast cancer. It is still widely used today. 1990: Anthony Maniglia, MD, was awarded the first of five patents leading to technology for developing the totally implantable cochlear implant. 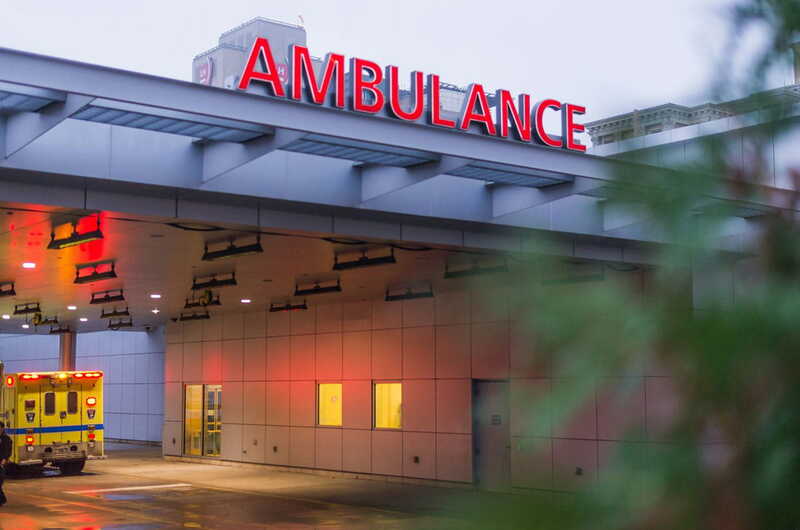 1991: The Rainbow Pediatric Trauma Center opened as Ohio’s first trauma center dedicated solely to the care of children; the trauma center earned a Level 1 designation in 1992. 1992: Henry Bohlman, MD, pioneered a new technique of anterior (frontal) decompression and fusion of the spine in the neck. This technique avoids disturbing the spinal cord, spinal nerves and the neck muscles, revolutionizing treatment for injury and degenerative conditions in this region of the spine. 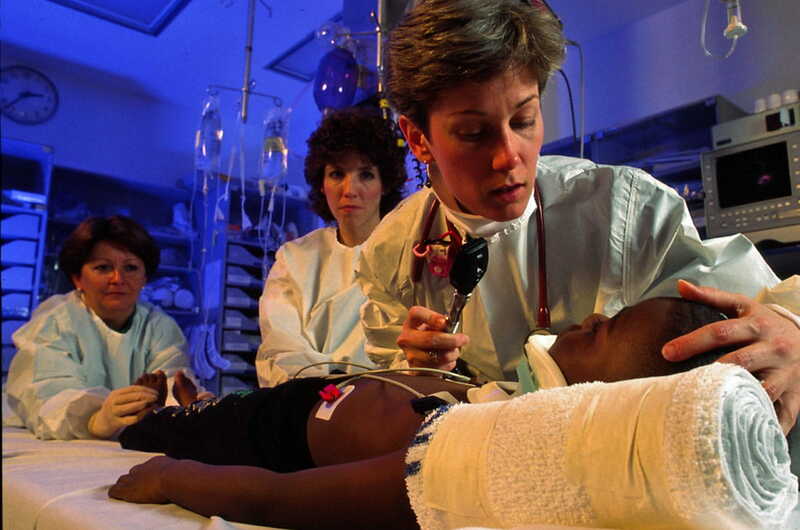 1993: UH began merging with various community hospitals in Geauga County, Bedford, Conneaut, Richmond Heights and Geneva to create a regional health care system. 1994: Huntington Willard, MD, describes Xist, the gene that is responsible for inactivation of one of two X chromosomes in females, and how it works. 1994: Alfred and Norma Lerner Tower & the Samuel Mather Pavilion opened on the University Circle campus through a gift of $10 million. 1994: Susan Shurin, MD, performed the first umbilical cord transplant to treat childhood leukemia, using cord blood stem cells from the patient’s newborn sister. 1995: Cliff Megerian, MD, proved the origin of inner ear tumors in Von Hippel-Lindau disease, an inherited disease that causes tumors and cysts throughout the body; in 2002 he described the first technique to remove these tumors and preserve hearing. 1995: Michael Konstan, MD, Pamela Davis, MD, PhD, and Charles Hoppel, MD, demonstrated ibuprofen’s profound effect on slowing the loss of lung function in patients with cystic fibrosis, and later showed that twice-daily therapy with high-dose ibuprofen improves survival. 1996: Pierluigi Gambetti, MD, developed the first classification of sporadic prion diseases, now used worldwide in diagnosing this class of dementias, caused by mutation of the prion protein gene. Dr. Gambetti defined and named fatal familial insomnia and also linked the same mutation to Creutzfeldt-Jakob disease. 1997: Leonard and Joan Horvitz Tower opened at UH Rainbow Babies & Children’s Hospital, named in recognition of the Horvitz family for their enduring generosity. 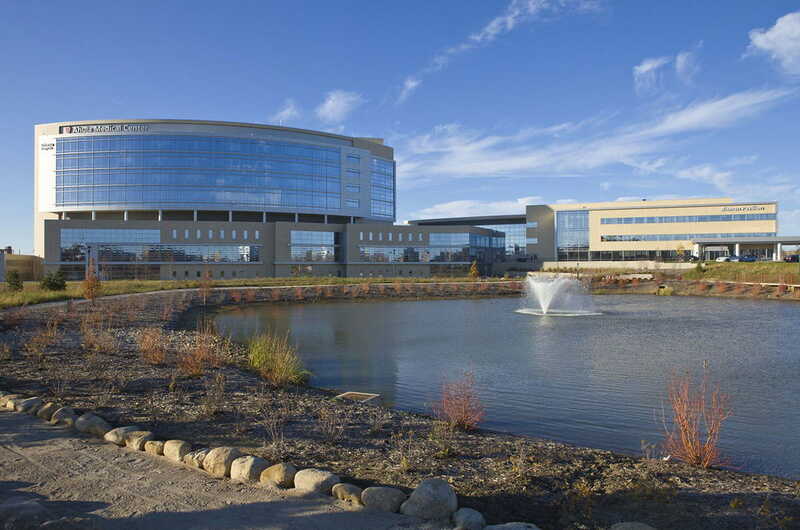 1997: University Hospitals partnered with Southwest General Health Center in Middleburg Heights. 1998: UH became the site of one of the world’s first intraoperative magnetic resonance imaging (MRI) scans. 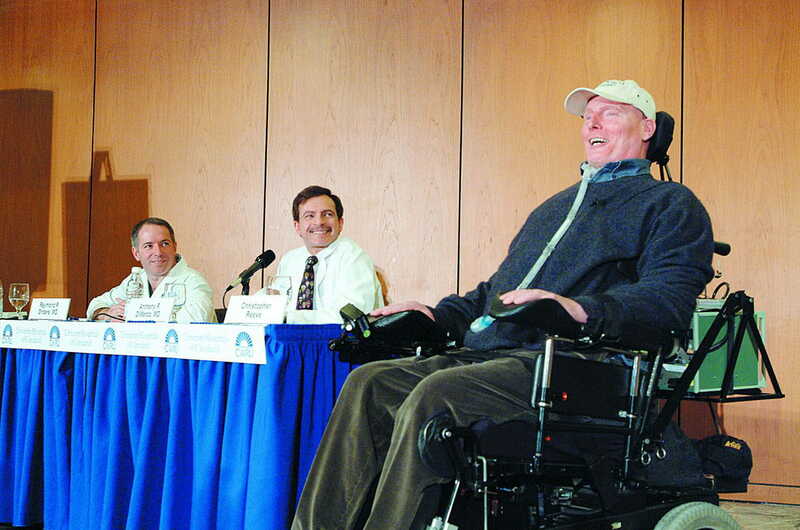 2000: Raymond Onders, MD, and colleagues developed an innovative diaphragmatic pacing system (DPS) that has since greatly improved the quality of life for paralyzed people and people with amyotrophic lateral sclerosis (ALS). 2001: Kumar Alagramam, PhD, identified an important gene responsible for Usher’s syndrome-related deafness, paving the way for potential new treatments. 2002: Jonathan Lass, MD, and a team led by Eric Pearlman, PhD, discovered the bacteria that in conjunction with a worm, Onchocerca volvulus, causes a disease of sub-Saharan Africa known as river blindness. Their work led to the use of antibiotics to treat this disease, a totally new approach. 2002: Pamela Davis, MD, PhD, and Michael Konstan, MD, performed the first-in-human clinical trial of a non-viral gene therapy approach in patients with cystic fibrosis using DNA nanoparticles. 2002: The reporting of an ALLHAT (Antihypertensive and Lipid-Lowering Treatment to Prevent Heart Attack Trial) study by Jackson Wright, MD, showed that thiazide-type diuretics should be considered first for drug therapy in patients with hypertension. 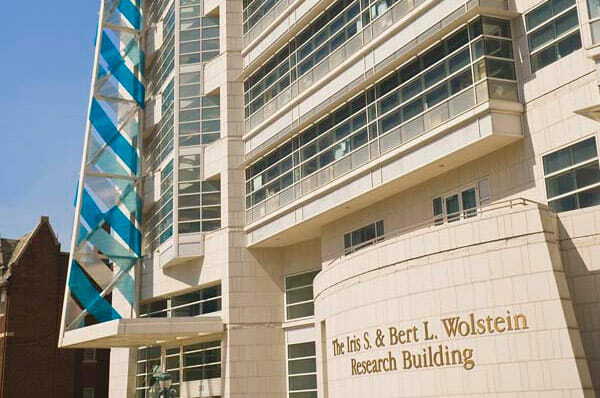 2003: Iris S. and Bert L. Wolstein Research Building opened, supported by a $25 million gift from the Wolsteins to UH and Case Western Reserve University. 2004: Robert J. Maciunas, MD, was the first surgeon in North America to treat Tourette syndrome with deep brain stimulation. 2004: Shawn McCandless, MD, and Suzanne Cassidy, MD, reported that chronic diseases of childhood are primarily genetically determined and that most patients admitted to a children’s hospital have an underlying genetically determined condition. 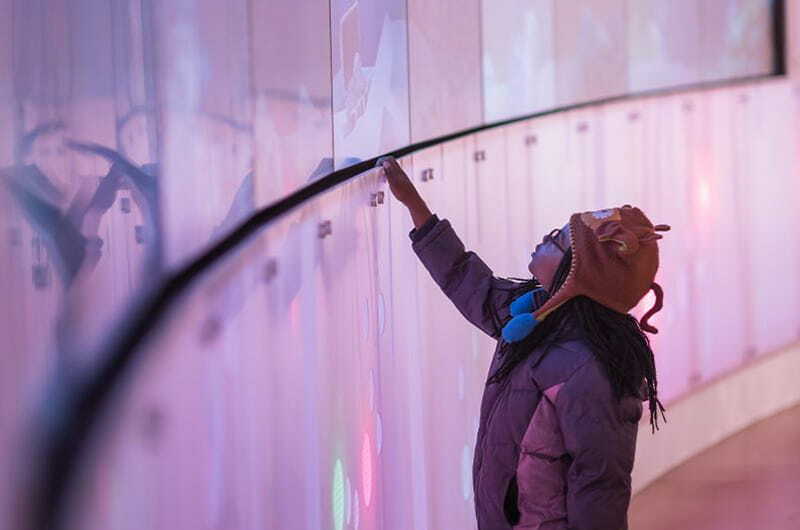 2004: A transformational gift of an initial $25 million from the Goodman family, which continues to grow today through their fund at The Cleveland Foundation, is recognized in naming the Dr. Donald J. and Ruth Weber Goodman Discovery Center for Clinical Research at UH Seidman Cancer Center. 2005: Cliff Megerian, MD, developed a minimally invasive treatment for glomus jugulare tumors, a rare, non-cancerous skull bone tumor that involves the inner and middle ear. 2005: Sanford Markowitz, MD, PhD, discovered a new stool DNA test for colon cancer that became the first commercial test for colon cancer detection. 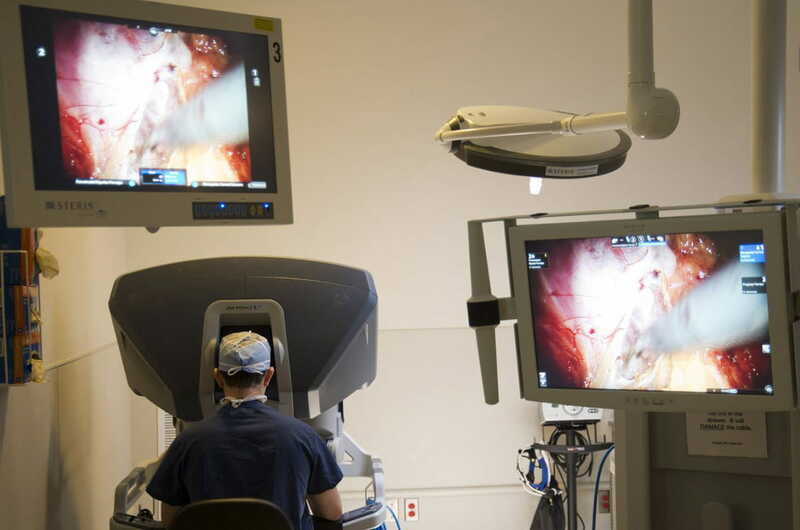 It was later approved by the American Cancer Society and the FDA as an alternative to colonoscopy. 2006: Vision 2010 was unveiled as a major initiative of facility and technology expansion. 2006: The UH Medical House Calls program is established, in collaboration with Internal Medicine and Nursing, bringing primary care services to homebound seniors who otherwise would not have access to care. It became a nationally recognized model of hospital-, community- and home-based geriatric care. 2008: Mark A. Griswold, PhD, developed parallel imaging technique for magnetic resonance imaging (MRI), which produces clearer, more accurate images in shorter time. 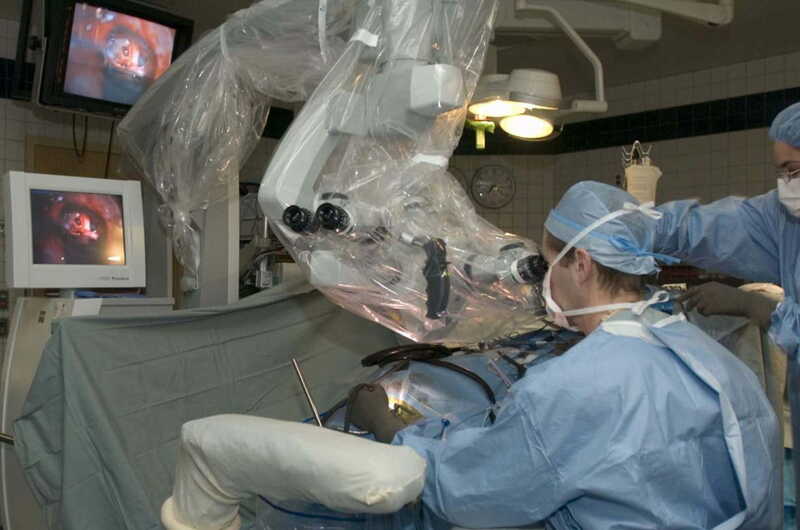 2008: Faruk H. Örge, MD, was the first in Ohio to use endoscopic and microsurgical techniques to drain excess fluid from the eye in infants and young children born with glaucoma. He also was the first in Northeast Ohio to use a new class of drugs (anti-VEGF) to treat retinal disease in premature infants. 2008: Ronald and Nancy Harrington and their family made a gift of $22.6 million to support the cardiovascular program at UH; in recognition, the program was renamed UH Harrington Heart & Vascular Institute. 2009: The 38-bed Quentin and Elisabeth Alexander Level IIIc Neonatal Intensive Care Unit, a Vision 2010 initiative, opened at UH Rainbow Babies & Children’s Hospital. The unit was named in honor of the longtime UH trustees and board members of the Elisabeth Severance Prentiss Foundation, which supported the project with a $10 million gift. 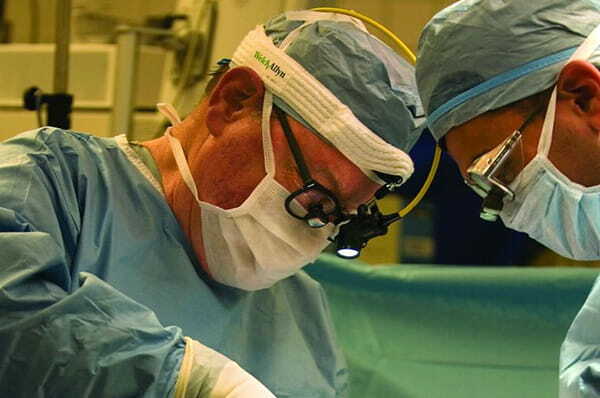 2009: The Brain Tumor and Neuro-Oncology Center, under the direction of Andrew Sloan, MD, pioneered a minimally invasive, MRI-guided laser system to treat previously inoperable brain tumors. 2010: UH announced the Discover the Difference fundraising campaign, which today has a goal of $1.5 billion, the largest campaign in the hospital system’s history and one of the largest hospital fundraising campaigns in the country. 2010: The Program of All-inclusive Care of the Elderly (PACE), one of only two such programs in Ohio, is established. PACE is a medical home for frail elders, designed to help them continue to live in the community by providing comprehensive medical, nursing, social services and rehabilitative care. 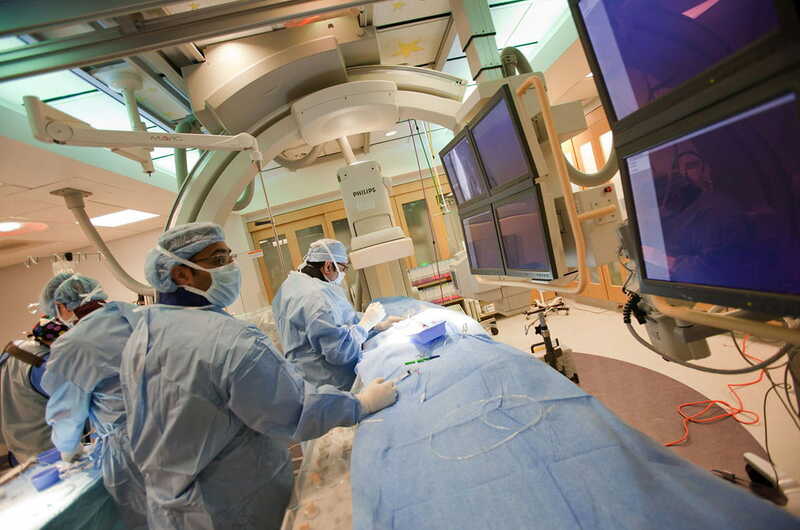 2010: UH became the only hospital in the country to offer three radiosurgery platforms – IMRT/IGRT TomoTherapy®, CyberKnife® and Gamma Knife® – in the same medical complex. This triple combination offered unparalleled options for patients in need of advanced radiation techniques. 2010: Pediatric urologists Jonathan Ross, MD, and Edward Cherullo, MD, performed one of the world’s first pediatric single-site nephrectomies. 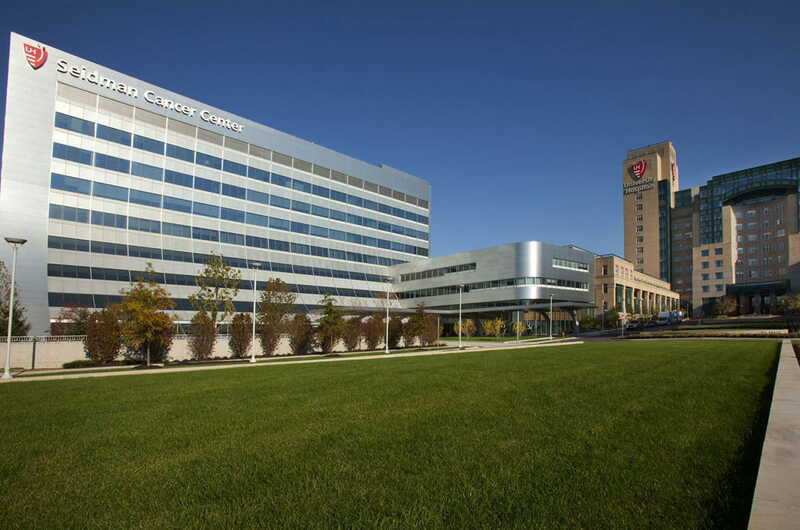 2011: UH Ahuja Medical Center opened in Beachwood. It is named in honor of former UH Board Chairman Monte Ahuja, his wife, Usha, and their family, who donated $30 million in support of Vision 2010. 2011: The three-story outpatient Kathy Risman Pavilion opened adjacent to UH Ahuja Medical Center, and was named in honor of the extraordinary generosity of Eleanore and Robert (Bob) Risman, and their daughter, Kathy. 2011: Chuck and Char Fowler, along with their family, made a $17 million gift to establish the Angie Fowler Adolescent & Young Adult Cancer Institute at UH Rainbow Babies & Children’s Hospital, named in honor of their late daughter, who passed away at age 14 while battling melanoma. 2011: UH Seidman Cancer Center opened, named in honor of Jane and Lee Seidman, who generously donated $42 million in support of Vision 2010. 2011: The Center for Emergency Medicine and the Marcy R. Horvitz Pediatric Emergency Center opened as a part of Vision 2010. 2012: Jonathan Miller, MD, performed the first temporoparietoocipital disconnection in the U.S., a procedure to remove tiny, non-functioning, sections of the brain where seizures originate, providing a cure for intractable epilepsy. 2012: Anthony Furlan, MD, published findings from a study that demonstrated that medical therapy is equivalent to interventional therapy for treating patients with PFO and stroke. The CLOSURE study was the first comparison of its kind and led to a significant decrease in interventions being done on stroke patients. 2012: The Harrington Discovery Institute was established as a result of a $50 million gift from the Harrington family, the largest gift in UH history to date. It identifies promising scientific discoveries and links the researchers responsible for them with scientific and business experts to transform the drug development process. 2012: Rainbow Babies & Children’s Foundation made a landmark gift of $32.5 million to University Hospitals in honor of the 125th anniversary of UH Rainbow Babies & Children's Hospital. 2012: UH Case Medical Center earned the American Hospital Association-McKesson Quest for Quality Prize as the nation’s top hospital for leadership and innovation in quality improvement and patient safety. 2012: Robert Findling, MD, showed the safety and efficacy of using medications such as lithium, antidepressants, and antipsychotics to treat childhood-onset psychiatric disorders, including bipolar disorder and schizophrenia. 2013: UH Case Medical Center was one of only 18 hospitals in the nation named to the U.S. News & World Report’s exclusive Best Hospitals 2013-2014 Honor Roll, ranking in all 12 methodology-ranked specialties, and in the top 20 in six of those specialties. 2013: Jonathan Lass, MD, William Reinhart, MD, and Beth Ann Benetz, MA, CRA, FOPS, participated in a National Eye Institute study demonstrating that donor age is not a significant factor in the success of corneal transplantation, significantly expanding the pool of available tissue by including older donors. 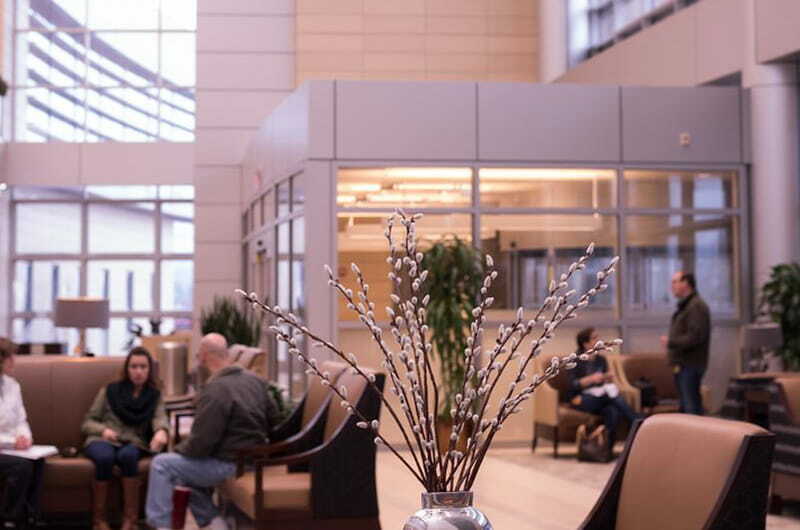 2014: University Hospitals expanded through the integration of hospitals in Elyria, Parma and Ravenna. 2014: Anthony Wynshaw-Boris, MD, describes a new mechanism for the correction of abnormal (ring) chromosomes by converting skin cells (fibroblasts) from patients into embryonic-like induced pluripotent stem cells. In the future, this may be used for correcting chromosome defects, such as the extra chromosome that causes Down syndrome. 2014: Jackson Wright Jr., MD, PhD, authors new results from the Systolic Blood Pressure Intervention Trial (SPRINT). The study showed that maintaining a new, lower target for systolic blood pressure, the top number in a blood pressure reading, results in lower heart attack, stroke and death rates. 2015: UH continued its expansion by integrating additional hospitals in Ashland and Westlake. 2015: Karen Mole and her family foundation, the Hampson Family Foundation, gave $10.6 million to UH Elyria Medical Center to support the development and expansion of programs that address the health care needs of Lorain County residents. 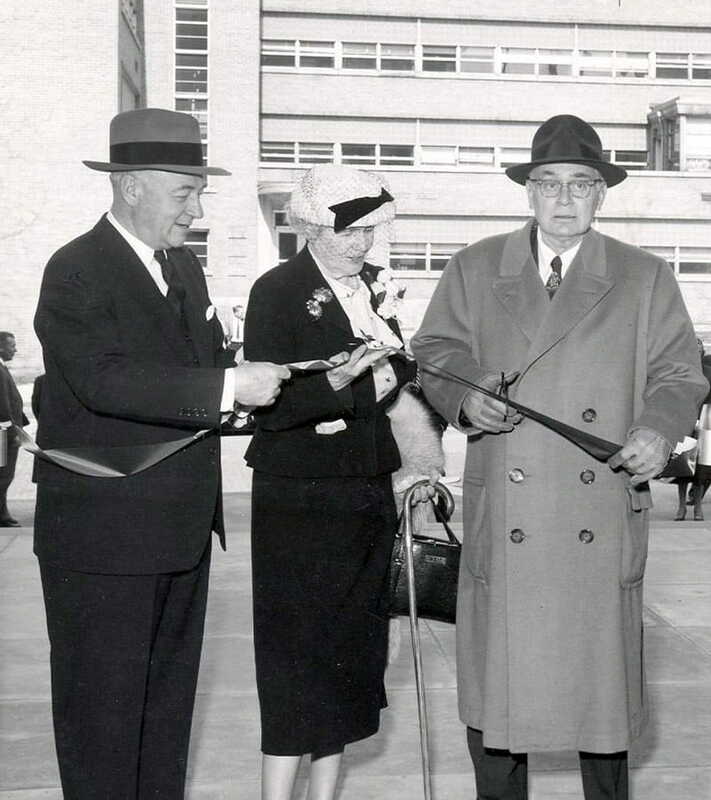 It is the largest gift ever made to the Elyria hospital, and the main pavilion at UH Elyria Medical Center was named the Hampson Mole Pavilion in honor of the donors. 2015: Jonathan Miller, MD, was the first in the world to demonstrate that DBS has the potential to improve memory after traumatic brain injury. 2016: A study conducted over 30 years by Saul Genuth, MD, the late William Dahms, MD, and Rose Gubitosi-Klug, MD, PhD, demonstrated that intensive diabetes management aimed at near-normal blood glucose levels reduces an individual’s risk of diabetes-related complications and mortality. 2016: University Hospitals is the first in Ohio and the region to offer proton therapy to treat cancer.